Despite its lower television ratings, The Walking Dead continues to whip people into an undead frenzy. 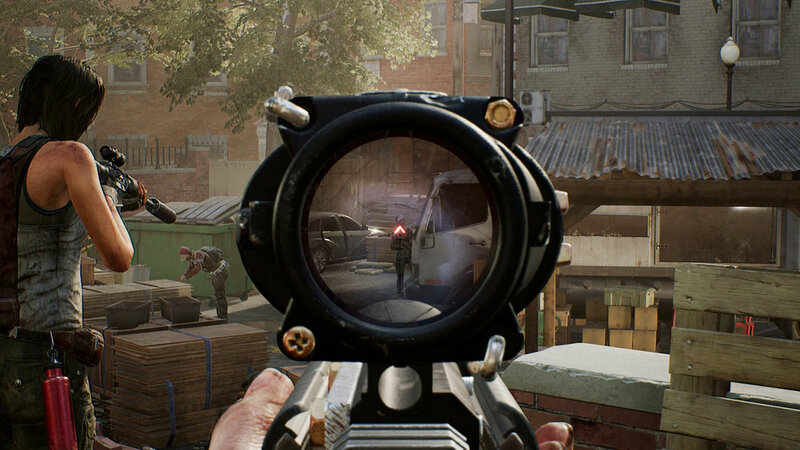 This would explain why the transmedia franchise has been turned into a team-based cooperative shooter by Overkill, a studio owned by Starbreeze. At first glance, the team survival game has (so far) little to do with the television (and possibly comic) other than the title. Set in and around the Washington D.C. area, four players must work together to complete various quests to keep themselves alive and create a sustainable lifestyle in the face of the shuffling undead as well as not-so-friendly humans. The thirty minute demo was rather telling. Like Sea of Thieves, this is going to be a game you’ll want to play with friends. Putting trust in a group of randoms to successfully navigate the randomized obstacles and merciless difficulty posed by zombies is more or less asking for trouble. The three gentleman I played the game with were initially chaotic and aggressively independent because it’s hard to tell the scope of the danger at first blush. I mean, come on! I’ve played Left 4 Dead, Dead Island, and Dying Light. I THINK I can handle a zombie or five. That mentality got me downed by monsters pretty quickly as a literal horde stepped out of a nearby house and made us all dead in no time. We fared a little better the second time around, largely because the horde had disappeared. One of the reps told us that the enemy placement changes each time the players load the area, which is great for establishing the tension associated with not knowing what lies around the corner. Four players can choose from a selection of pre-generated characters that fall into familiar roles, like tank and support. Before choosing which area to play in, you can choose from a selection of weapons (firearms and melee) to form the character’s loadout. There seemed to be an emphasis on everyone picking up good equipment and gear because certain areas can only be accessed and bypass by those who happened to choose the lock pick or wire cutters. Everyone in my group had a silencer attached to their weapon (by the way, a silencer of a shotgun is still the funniest thing ever) that degrades with each use. There didn’t seem to be any opportunity to repair it or switch it out for another in the demo, which kinda sucked because the durability of the accessory was quite low. And when you fire a gun without a silencer, you can bet a horde will show up to say hello. Gunfire and other loud noises will also attract bad humans, whose AI routines fall within the scope of detection meters (white if they notice you, yellow gets them walking to your last known position, red is hostile). With its strong reliance on team communication, strategy, and planning, The Walking Dead could strike a loud chord in the multiplayer community. I wouldn’t be surprised if it finds itself targeted for competitive play, either. It seems ripe to be played in front of a live studio audience. Though The Walking Dead has some interesting ideas and gameplay, I can see it requiring a lot of patience from people. This is not the sort of video game to play if you like running out and slaughtering undead like an enraged barbarian. It requires a more thoughtful and methodical approach. Fair warning.